We are a "masters" swimming club for adults, aged 18 years and over, and our club is part of the worldwide community of Masters swimmers. Our members come from a variety of backgrounds: some are fresh out of age-group competition, others have only recently learned to swim, and others have only taken up swimming again after a break. Because of this, we have a variety of abilities and training requirements ranging from social swimmers (some do more talking than swimming) through to national champions. This includes pool swimmers, open-water swimmers and triathletes. Our insurance now requires everyone in our training sessions to be a club member, although you have 4 come-and-try sessions in the first month before you have to join. If you wish to compete at Masters Swimming events (except for Masters Games), you must be a member of a club registered with Masters Swimming. Club membership includes registration with Masters Swimming Victoria ("MSV") and Masters Swimming Australia ("MSA"). * includes discount for members aged 18 to 24. 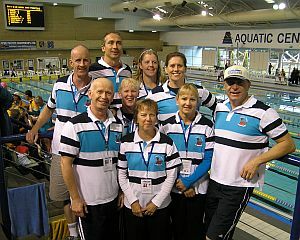 Masters Swimming Australia, previously known as AUSSI Masters Swimming, was established in 1976 and has the motto of swimming for "Fitness, Friendship and Fun". There are currently more than 1,000 members in Victoria and over 7,000 around Australia. You certainly don't have to be a star swimmer to compete, especially in the smaller interclub meets which are fun and often informal events with a supper afterwards. In most Master Swimming competitions, you will be placed into heats with other swimmers of a similar standard based on the entry time that you put in, regardless of your age and gender. This way you don't have to be embarrassed about not being one of the fastest swimmers. You don't even have to know how to dive - you can start in the water if you'd prefer. Remember that the emphasis in Masters Swimming is participation and having fun, rather than winning. Joining is easy - just go to the MSV Member Portal on the Masters Swimming Victoria (MSV) website. On the MSV home page, click on the blue "Member Portal" on the top right-hand side of the page. It will take you into the registration system where you can join as a new member or re-register if you're already a member. From there you just need to follow the prompts. You can also pay your registration fee at the same time through the MSV Member Portal. Please contact any of the Committee members for more information.